Almost half the world's population is under 25 and youth involvement in politics is crucial to improve democracies. From October 16 to 18, 2012, we conducted a three-day meeting - "Youth Participation and Democratic Governance in Latin America and the Caribbean" - in Mexico City to discuss how to boost the involvement of young people in politics and expand their role in consolidating democracy in Latin America and the Caribbean. More than 30 youth organisations, young political leaders and governmental counterparts participated. Electoral democracy has spread and consolidated in our region since the early 1990s. But the quality of our democracies is a concern. Citizens are frustrated by wide disparities in wealth and power and there is weak popular participation in public affairs - especially among young generations. Moreover, public and private corruption, citizen insecurity and weak public institutions are major threats. Youth involvement in politics is crucial to improve democracies - and not only in Latin America. Almost half the world's population is under 25 and more than one third is aged 12 to 24. This fact, along with social and economic inequality among youth expressed in recent social movements like the Arab Spring, Spain's 15M, Mexico's YoSoy132 movement and the student protests in Chile reaffirm the need to address the young generation's demands and recognise young people's critical role in promoting social change. Of the 600 million people in Latin America and the Caribbean, more than 26 per cent are aged 15 to 29. This is a unique opportunity for the region's development and for its present and future governance. The UN Development Program's (UNDP) Human Development Reports have shown that young people have enormous potential as agents of change. But despite Latin America's remarkable progress in reducing poverty and inequality, and its strides toward strong democracies with free and transparent elections, structural problems perpetuate unequal rights and opportunities among citizens, including in job opportunities and access to public goods and services. All of this directly affects young people. Income, gender, ethnic origin, or dwelling conditions are decisive barriers to young citizens' rights. One in every four young people aged 15 to 29 in the region are poor or extremely poor, and only 35 per cent have access to education. About half complete basic education, but only 18 per cent attend college, and access to quality education is unequal. 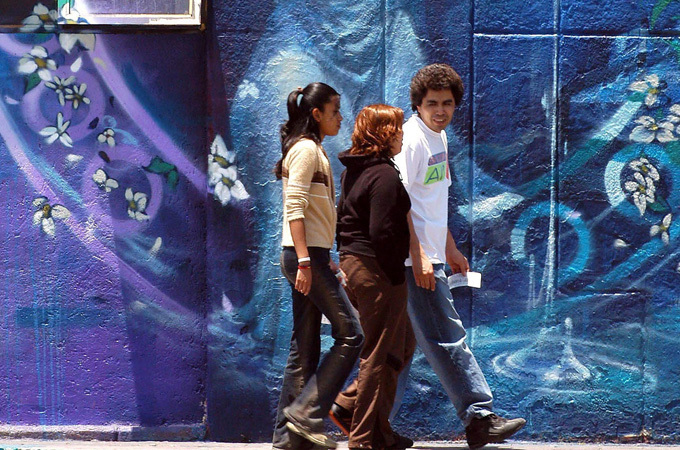 More worrying still: Some 20 million young Latin Americans aged 15 to 18 neither work nor study. That's nearly one in every five, 54 per cent of them female and 46 per cent male. Many young people are exposed to tremendous risk and violence. The region comprises less than 9 per cent of the world's population but accounts for 27 per cent of its homicides, the UNDP has found. As a result, public perceptions of the young are distorted. Those from low-income communities in particular are seen as potentially violent, morally weak and frequent substance abusers. A recent UNESCO study has found that young men and women in Latin America see themselves as largely underrepresented and disenfranchised from traditional political mechanisms. Only 5 to 10 per cent claim to take part of some kind of citizen engagement - normally focused on sports and religious-related activities. At the same time, boosting young people's political participation is one of the main concerns and demands of youth organisations. Since effective youth participation strengthens and renews democracy, over the next three days in Mexico we will discuss what governments, civil society, and the UN are doing to boost political inclusion of young people in the region. We will also discuss the promise of technology and social networks, including electronic platforms linked to UNDP, whose Virtual School has trained numerous young men and women in the region, notably those of African or indigenous descent, on political inclusion. The region needs to promote youth political participation. Generations of Latin Americans now have the privilege of living in democratic societies. Now it's up to us all to help them get involved and shape their own future.